Ansar Allah (Partisans of God), which is also known as the Houthi movement, has experienced several major transformations in arriving at its current dominant position in Yemeni politics. It began in the 1990s as a youth-orientated revivalist movement that wanted to defend the religious traditions of a branch of Shia Islam known as Zaidism. By the 2000s, it was leading a stubborn military insurgency that enveloped tribal politics in the far northern governorate of Saada. Its objective was to defend itself and its allies against President Ali Abdullah Saleh's military. When the Arab Spring began in 2011, Ansar Allah was a welcome supporter of the peaceful protests against Mr Saleh and actively participated in the National Dialogue that followed his fall. The group backed regional autonomy, respect for diversity, and the strengthening of a democratic state. But as the interim government of President Abdrabbuh Mansour Hadi stalled in early 2014, Ansar Allah launched an aggressive military campaign in the north, defeating key military units allied to Gen Ali Mohsen al-Ahmar and the Islah political party. This culminated in its descent upon the capital, Sanaa, in September 2014. Ansar Allah's stated aim was to install a more effective interim government to implement the outcomes of the National Dialogue. But clearly, it also sought military dominance in the north. In the last year, an alliance with its former enemy, Mr Saleh, played a key role in transforming Ansar Allah into the dominant military and political force in the country. For his part, the former president used the alliance with Ansar Allah to overthrow the Gulf-backed Hadi government and carve a more secure place for himself in future Yemeni politics. The source of Ansar Allah's power is principally domestic and political, not religious. The Zaidi "Sada" - those claiming descent from the Prophet Muhammad's family, and who played a special role in the regimes of the Zaidi Imams that ruled North Yemen for almost 1,000 years until 1962 - were discriminated against by the leaders of the new republican Yemen because they were perceived as a threat. In the liberal period of the 1990s, some of the Sada emerged to search for a place for themselves in the republic. They formed two political parties, al-Haqq (Truth) and Ittihad al-Quwa al-Shaabiyya (Union of Popular Forces). Al-Shabab al-Muminin (Believing Youth), the predecessor of Ansar Allah, was meanwhile founded by Hussein al-Houthi to revive Zaidi tradition in the face of effective proselytising among the young by Saudi-backed Wahhabis and local Salafists. But it was the attack of the Saleh regime on al-Shabab al-Muminin that propelled the movement to the fore of Yemeni politics. Hussein al-Houthi challenged President Saleh's legitimacy by claiming that he was weak and beholden to the United States and its "War on Terror". In the context of the US-led invasion of Iraq, he chanted: "Death to America. Death to Israel. Curse the Jews. Long live Islam in the Grand Mosque of Sanaa." However, the target of the chant was Mr Saleh, not America or Israel. Mr Saleh attempted to repress the movement by force, but the tactics of the Yemeni military pursuing Hussein in the north alienated large sections of the population. Ansar Allah's power grew from exploiting resentments against the Saleh regime, its military, and the leadership of the Hashid tribal confederation by the regime's key tribal supporters, the al-Ahmar family. Ansar Allah knew northern Yemeni society and tribal organisation intimately, and those that fought for Ansar Allah against Saleh did not fight for Zaidi religious beliefs, but for freedom from oppression by an autocratic ruler. Ansar Allah provided credible political and military leadership, not religious guidance. The successful revolt of Ansar Allah in Saada was one of the key political failures of the Saleh rule. A similar failure took shape in the south, where popular rejection of Saleh's regime was widespread, but without effective political leadership. Ansar Allah's support was drawn from those who rejected Mr Saleh's regime in the south, in the middle regions of Taizz, in the eastern desert of Marib and the Jawf, along with the educated youth activists of Sanaa. Ansar Allah joined the other anti-Saleh forces to forge the outlines of the liberal, post-Saleh regime. However, the interim government of President Hadi - Mr Saleh's former deputy - floundered. The National Dialogue took longer than expected, the question of the federal division of Yemen was not resolved consensually, and the rankling among political parties jockeying for position in the post-transition elections strangled the government while the economy deteriorated. Ansar Allah began in early 2014 to take matters into its own hands. It appeared to distrust the interim process and aimed initially to guarantee its military dominance of the north. Ansar Allah had been the victim of Mr Saleh's military in the 2000s and the organisation, fearing the incompetence of the interim government, moved to guarantee its own security. Mr Saleh played a key role in this last phase of Ansar Allah's expansion. Image caption Ansar Allah's slogan is: "God is great. Death to America. Death to Israel. A curse on the Jews. Victory to Islam." In the interim period, the former president became an international pariah because of his interference in the transitional government. In Ansar Allah, Mr Saleh saw a chance to change the balance of power in Yemen by defeating those that defected from him in the last days of his rule. Ansar Allah attacked the Hashid tribal leadership of the al-Ahmar family, the Islah party, and the military units of the party's ally, Gen Ali Mohsen al-Ahmar (who is unrelated to the Hashid leaders). It defeated Mr Saleh's enemies in the interim government. But Ansar Allah made big political mistakes. Its military wing moved fast to achieve maximum advantage without, it appears, consulting the movement's political strategists. Or else, perhaps, the organisation had no political strategy. Ansar Allah retained the support of Yemen's political leaders and international backers of Yemen's transitional government as long as it adhered to the principles of the National Dialogue. However, it broke those rules when it tried to dictate terms to President Hadi and he refused. Mr Hadi's resignation in January galvanised opposition to Ansar Allah in Sanaa and the southern and eastern regions of the country. 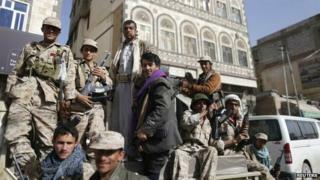 Now, Ansar Allah appears to lack a political strategy to unite Yemen's diverse political groups. Mr Saleh may be hoping for Ansar Allah political mistakes to weaken the movement, leaving him in a key position to negotiate Yemen's political future. However, Ansar Allah may have sufficient military advantage to consolidate its control of much of the rest of the country and repress any attempts by Mr Saleh to undermine the movement. Mr Saleh may be a prisoner of Ansar Allah. Ansar Allah wants to consolidate its control of as much of the country as possible, particularly the oil-rich eastern portion of the country, and it wants to consolidate its political position, particularly with international recognition. While Ansar Allah may be able to further its military gains in the south, for example, where a very divided political leadership leaves the south vulnerable to manipulation, the Gulf states and the US appear intent upon denying Ansar Allah international recognition and supporting Mr Hadi's claim to leadership. Yemen may see a long stand-off between Ansar Allah's north and President Hadi's south and east.